You’ll laugh, you’ll cry, you’ll want a pie! Mild mannered Alan Ledger is out of his depth. Like a Chartered Accountant Alice through the Looking Glass, he has entered a world that makes no sense at all – The World of Scottish Football! Once great, Dunwearie Football Club has entered insolvency. Players’ wages went up as income went down. Now they need a super-hero, a number crunching ninja. That’s when Alan Ledger reveals his true identity, Insolvency Man! Our struggling hero does his best to cope with delusional club owners, power hungry Association officials, foul mouthed managers, passionate fans and the enigmatic, unyielding Pieman – the last creditor who holds all the aces. 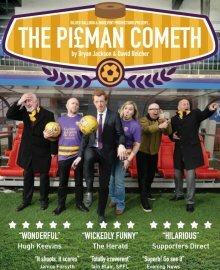 A farce, laced with affectionate cynicism, our play sees Alan Ledger attempt to save the club that seems determined to fall apart despite the best wishes of all involved. Can he make them see sense, can he find a way for them to work together for the club’s benefit rather than serve their own deluded sense of self importance? In a murky world of dodgy deals, ridiculous rules, ancient allegiances and downright dirty dealing, is there any way of saving Dunwearie? If anyone can, it’s Insolvency Man……only he’s not so sure….